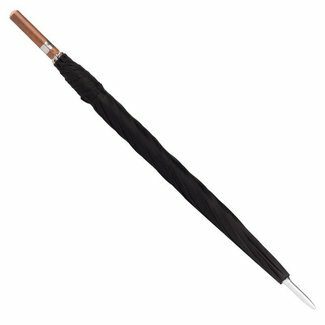 Swaine Adeney Brigg umbrella with a solid chestnut straight ..
Swaine Adeney Brigg umbrella with a solid chestnut crook han.. The very epitome of British class, an umbrella is a sophisticated accessory that no gentleman should be without. 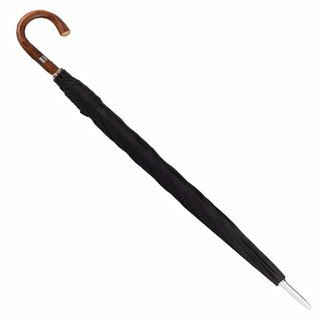 But not just any umbrella will do, a Swaine Adeney Brigg model is fitting for any occasion with its fine details and exquisite workmanship. When you choose an umbrella from Swaine Adeney Brigg, you are acquiring a little piece of history, with a brand that has been making umbrellas for almost two centuries. Thrill at the silky canvas and run your fingers over the smooth handle and you'll appreciate all the detailing that has gone into creating a true piece of craftsmanship. Swaine Adeney Brigg was formed in 1943 but was an amalgamation of companies which had already achieved considerable success. Thomas Brigg & Sons, the original makers of the umbrella, started in 1836 providing quality umbrellas of exceptional quality to the noble classes in Victorian society. Their craftsmanship was held in such high esteem that they very quickly received the highest accolade possible, a Royal Appointment with Her Majesty Queen Victoria. Latterly, additional royal appointments were made by His Majesty King Edward VII. Thomas Brigg & Sons were the very first umbrella makers to ever receive a royal appointment, but such was the quality of their work that they were in demand by the very highest in society. In recognition of this, they also held a branch in Paris right up until World War II. 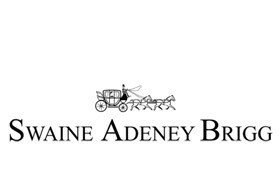 Swaine & Adeney, makers of other accessories for distinguished gentlemen, merge with Thomas Brigg in 1943 and the new company was henceforth known as Swaine , Adeney, Brigg & Sons. The umbrellas have continued to be referred to as Brigg umbrellas, and the exceptional quality which so enchanted royalty, the noble classes and the socially elite has continued unabated. Swaine Adeney Brigg still features a range of different umbrellas, designed for the discerning gentleman. With impeccable craftsmanship, there's no better umbrella maker in the country, and carrying one of Briggs' creations bestows instant class and appeal. The crook handle umbrella is one of the most popular designs, easy to carry and conveying an air of easy sophistication. Available in navy, black or racing green, the colours are muted and elegant, and will complement any gentleman's attire. At 98 cm in height, and 115 cm when opened, the proportions are generous without being overwhelming. There's also a crook handle made from solid chestnut and a stylish steel collar, complete with Royal Warrant. 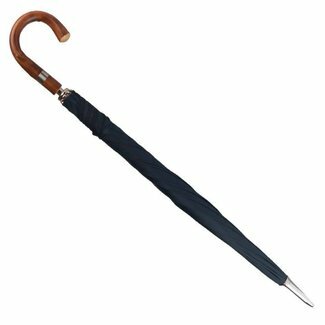 Carrying a crook handle umbrella from Briggs is guaranteed to make any gentleman a dashing sight indeed! As an alternative to the popular crook handle, Swaine Adeney Brigg also offers a straight handled design, for easy storage and transportation. Also available in black, navy and racing green, the dimensions of the straight handled Briggs umbrella are exactly the same as its crook handled counterpart. There's the same exquisite attention to detail with the solid wood handle made from chestnut and the Royal Warrant affixed to the steel collar. Briggs umbrellas certainly aren't an accessory to be ignored; they command quiet attention and carry an instant air of authority and panache. 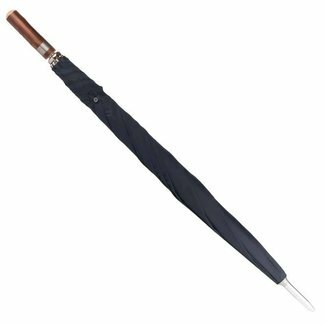 For the man around town, a Briggs umbrella is a symbol of quality, confirming the gentleman has immaculate poise and is debonair, smooth and suave. There's no doubting the class of a city gent who opts for a Swaine Adeney Brigg design. With a commitment to quality and an easy, cultured appearance, he will turn heads as he strolls through the streets.